The Driftless Area is gorgeous. The Kickapoo River Valley from Ontario through Wauzeka, and all the side canyons. Viroqua is an awesome little town, with two local and sustainable restaurants on the main drag, a stocked, quality food co-op, a bookstore with the best selection of homesteading/ organic farming/ permaculture books I've seen, and a Waldorf school that has brought hundreds of families to the region to stay. El and I realized we're a consumer demographic. The land is gorgeous, circumvented by the glaciers that flattened the rest of the midwest. Industrial agriculture never got a foothold because the land is just too rumpled, too full of nooks and valleys, the farms too broken up. So it was poor for a while, until the Organic Valley Cooperative turned it into the organic dairy hub of the world. The Kickapoo River is the windiest river in the states, snaking around through its ancient floodplain taking its sweet time to meet up with the Wisconsin then dump into the Mississippi. 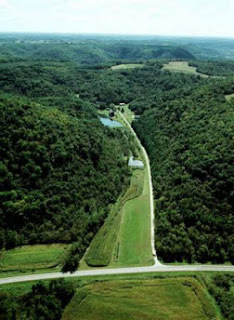 The Kickapoo Valley Reserve formed after a bungled government flood-control intervention left La Farge with an unfinished dam and a lot of relocated families and ire in the community. It is co-managed with the Ho-Chunk Indian tribe. * 3 homes, a big barn, a few other outbuildings, and the original sandstone settler's cottage that needs some fixing up. * 2 ponds full of fish. * An entire miniature watershed following a side canyon of the river canyon and its three little headwater canyons. * A pasture up top, garden space all around the homes and ponds, a pasture in the canyon, and a pasture down in the river's hundred-year floodplain. * Lots of woods everywhere else. We saw this place on the side of the road and drove in to check it out. Found the listing later: 15287 Turfan Rd., Gays Mills, WI. "221 acres of natural beauty. This property has 57 acres along the Kickapoo River, 2 very large ponds with fish, 167 wooded acres in the MFL, and 3 homes, a 34x56â€™ pole building and barn used for entertaining all immaculately cared for. The newest home/chalet has over 3000 sq ft (4BR, 2.75 bath) and overlooks the largest pond. Excellent retirement home or family retreat. This property has it all. Rentals properties could be sold for $150,000 reducing overall investment." The questions remain: what to do with this land? How to make it pay? How to avoid isolation? I imagine something like seven families going in on it. 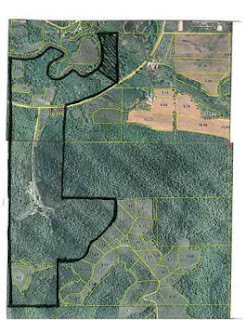 That's 30+ acres per family for $115,000 each. 20% down on a 15-year loan, so a $4900 mortgage. $900 per family. Add to that cooperative fees for tools, land management, facility maintenance, and such, and each family might pay between $1100 and $1500 per month, depending on whether we're paying or installing power systems individually or collectively and so on. My thought is that each family would need to come up with this amount regularly. People could establish ventures to make the land pay -- for example, we might collectively own and operate an inn or bed & breakfast while also using the barn as a venue for weddings, concerts, or retreats, meanwhile having it all in the midst of a working farm. We could potentially all earn all of our income on-site, but we wouldn't have to. We would just need to make the minimum payment every month, and could do so with an outside job. Key notions: Economic resilience. Pooling resources. Diversifying revenue streams. Having a powerful tangible asset. Creating value. Generating Surplus. Hard work. Communication. Cooperation. Success. Setting an example. Participating in the resilient communities network/ movement. A final thought on how to do it: run it as a business? As a cooperative business? As a nonprofit organization? As a land trust? Research this. A good legal model for striking the right balance between cooperation and independence, with clear but flexible boundaries. More on this here. 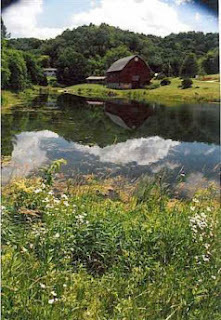 The Wormfarm: A working farm in the Driftless Area with artist residencies.